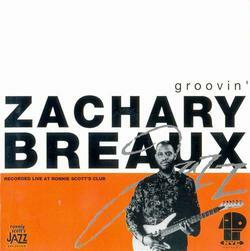 Debut album by jazz guitarist Zachary Breaux recorded live at Ronnie Scott's club in London. This 1992 release shows Zachary to be a flexible guitarist handling soul jazz, post bop jazz and even pop influences on tunes such as John Coltrane's Impressions and Ben Tucker's Coming Home Baby and some of his original material. Features drummer Dennis Davis, bassist Donald Nicks, keyboardist Rex Rideout and Roy Ayers on vocals and marimba on one track. There are two different versions of the front cover for this CD.